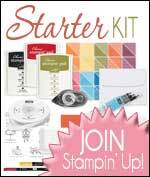 This is a great way to increase your Stampin' Up! stash, and create with our wonderful papers. There are so many things you can do with our Designer Series Paper - from cards to scrapbooking to favour making to invites for that special celebration. Click here to view the papers on offer. Details of the promotion are below. -Three packs of paper must be bought in one purchase to qualify (not spread out over the month). Deadline: Online by 31 October 2016 @ 22:50 GMT.